This morning I started out with the ‘Torre del Oro’, which translates to the ‘Tower of Gold’. Picture taken from Triana Bridge. 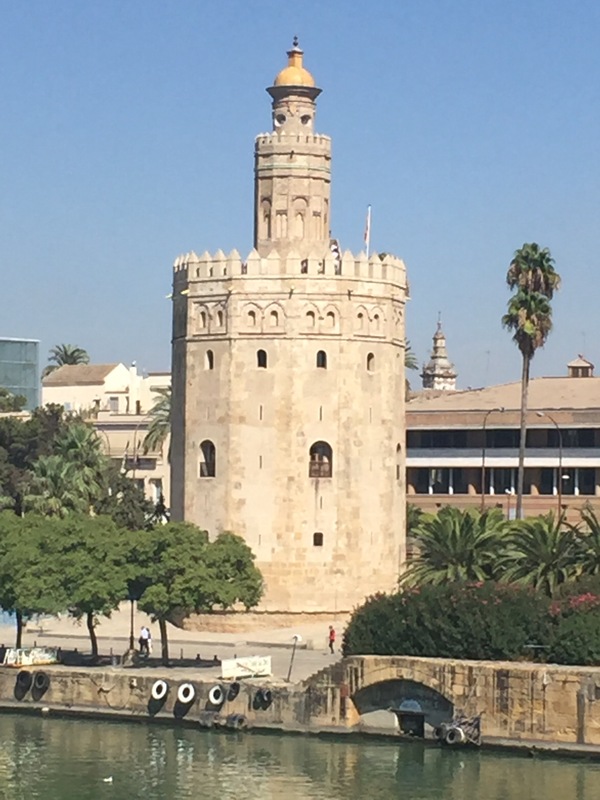 The Torre del Oro is a dodecagonal (12 sided) military watch tower located in Sevilla on the Guadalquivir River. The Guadalquivir River is the second longest river in Spain and is mostly used by drug smugglers these days. I think mostly hashish coming in from Morocco (just a guess). But back in the 13th century it was used to export port, oil, wool, wine, metal, cheese, etc throughout all of Europe. The ‘Torre del Oro’ was built in the 13th century around 1220 and was the last major building that the Muslims constructed in Sevilla. It was originally built to prevent the Christians from attacking Sevilla from the water (some good this did!). It was mainly used as a watch tower designed to protect the docks. King Pedro kept treasures of gold and silver in this tower and also hid his mistresss here. King Pedro also goes by ‘Peter the Cruel’. I laugh to myself every time I hear the name ‘Peter the Cruel’, because as a little girl (and possibly as a young adult), I used to refer to my Uncle Peter by this name (behind his back, of course). Some say this is where the tower got its name. However, there are two conflicting stories as to how the tower actually got its name. The other story states that after a restoration in 2005, experts discovered that the building was covered with lime and straw mortor giving it this golden reflection. Throughout the years, the ‘Torre del Oro’ has been restored countless times and nearly demolished twice by earthquakes. It has been used as a fortress, a post office, a chapel, a gun powder warehouse, a prison, and even the Guadalquivir River Company main office. Than in 1936 the Maritime Museam was installed in the tower showcasing the navel history of Sevilla. I had a beautiful, relaxing morning and enjoyed visiting this naval museum. I walked home to get ready to go to school and discovered that Gloria had made her lentil soup or sopa de lenteja. I LOVE her lentil soup! I honestly don’t know what she does to these lentils but it’s just so delicious! And very clean and light, especially for lentil soup. I sat down and ate a bowl and than left for school. I later texted Gloria from school asking if she would save me some soup for dinner and she did-and it was delicious! I had it with picos for dinner. I could go on and on about pico’s, but basically all you need to know (if you don’t already), is that they are like hard little breadsticks and they are painfully addictive. They are made with toasted sesame seeds that you crush with a mortar and pestle. And, the pico’s go well with everything! !